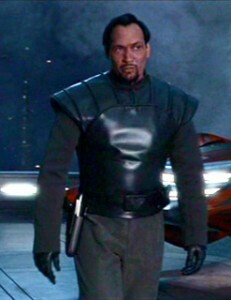 Bail Prestor Organa was a Human male who served as the First Chairman and Viceroy of Alderaan, and served in the Galactic Senate as the Senator of the Alderaan sector from 32 BBY to 19 BBY. Subsequently, he was Senator of the Alderaan sector of the Imperial Senate from 19 BBY to 1 BBY. He was Princess Leia Organa’s adoptive father and a friend of Jedi Masters Obi-Wan Kenobi, Yoda and Rahm Kota. He was married to Queen Breha Organa of Alderaan and was, as Prince Consort, head of the royal house and ruler of Alderaan. One of the main founders of the Rebel Alliance, he was killed when the Death Star obliterated Alderaan. In the Alliance and its successor states, the New Republic and Galactic Federation of Free Alliances, he was respected as a martyr who died for his cause. Medium olive-brown tailored jumpsuit with a tall, standing collar, zipper placket and long sleeves that end below the wrist. Dark olive-brown leather or leather-like jerkin that ends just below the waist with a wide contoured yoke with vertical strips of piping in a dark olive-brown suede or suede-like material. Dark olive-brown wide leather or leather-like belt with a smaller leather or leather-like buckle decorated with a small silver symbol of Alderaan. The belt also has two dark olive-brown leather or leather-like pouches at the left side and a structured contoured holster at the right side. Knee-high black leather or leather-like boots with a wide half strap over the front of each ankle. Streamlined blaster with a short silver barrel and a dark gray or black handle. Hair must be shorn above the collar with a thin mustache and closely trimmed goatee; naturally-occurring hair colors only.